Description: This sweet quilt is a little "mini" cabin block. Only one round around the center. What could be simpler! It was a fun little project made at my cozy little cabin on the Mississippi River. A great summer memory! 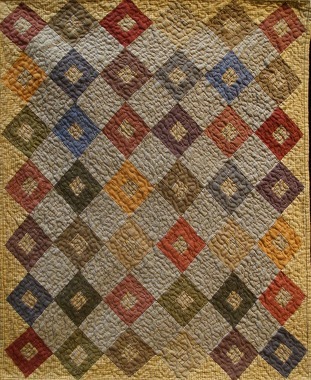 Suzanne and Selma have been quilting in southern Wisconsin for more than 35 years and have created numerous patterns. Selma lives in a 120 year old farm house that has been the perfect back drop for quilting. Quilting in some form or another is a daily occurrence for both of us. Both shopgirls have worked in Spring Green, WI for many years where they have the opportunity to meet and work with several wonderful people in the quilt world.